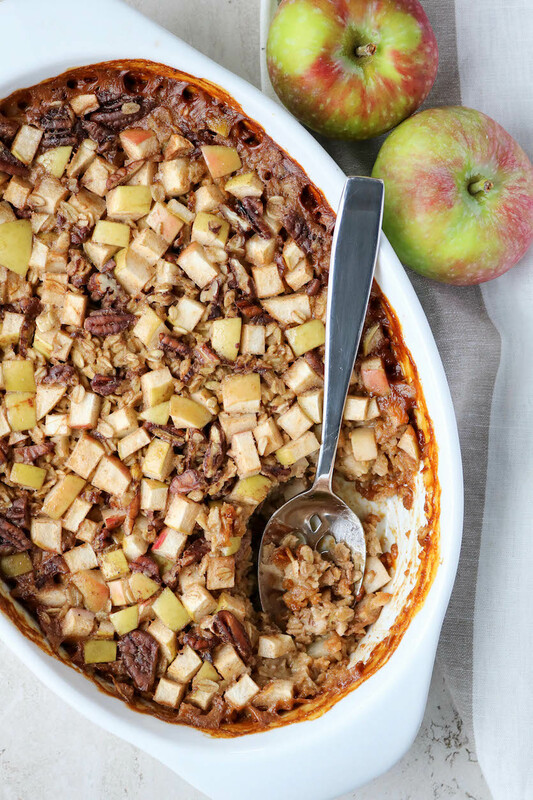 A little make-ahead breakfast goes a long way in setting you up for a week of success, and this Apple Pie Baked Oatmeal is just the thing you need on a cold fall morning. Apple season, it’s just the best, isn’t it? There are literally thousands of different ways you can use apples, from savoury to sweet dishes, breakfast to dinner, and snacks to desserts. Personally, I just love a good crunchy apple on its own as a simple snack, however, my second favourite way to eat them is in my morning oatmeal. The good news is, you don’t need to stand over a hot stove every morning, especially if you are short on time, when you can make a batch of baked oatmeal for the whole week. I’ve already shared a Mixed Berry Baked Oatmeal on the blog, so this is just a fall-inspired version of a similar dish. Whip up this simple Apple Pie Baked Oatmeal on a Sunday afternoon and you’ll have a delicious quick and easy breakfast ready to go every morning of the week. 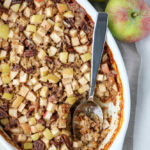 I used McIntosh apples in this recipe, but you can honestly use any type of apple you like. This Apple Pie Baked Oatmeal can be re-heat or eaten cold on its own or with an additional splash of milk. Preheat oven to 375°F, and grease a 9 x 9 baking dish. In a mixing bowl, combine all of the dry ingredients; oats, pecans, cinnamon, nutmeg, cloves, baking soda, and salt. Stir to ensure everything is well mixed and then transfer to baking dish. In the same mixing bowl, combine all of the wet ingredients; almond milk, vanilla extract, egg, maple syrup, melted coconut oil or butter, and diced apples. Transfer the wet ingredients to the baking dish with the dry ingredients and mix everything until well combined. Transfer baking dish to the oven for 35-40 minutes until golden brown. The oatmeal can be served immediately or stored in the fridge covered for up to 5 days. Serve on its own hot or cold, or serve warmed up with an extra splash of almond milk and drizzle of maple syrup. PreviousPrevious post:5 Nutrition Myths that Need to GoNextNext post:Does Red Meat Cause Inflammation?